We Thank You for your decision to provide Teena’s Pride ultra-fresh and highly nutritious greens and vegetables to your patrons. 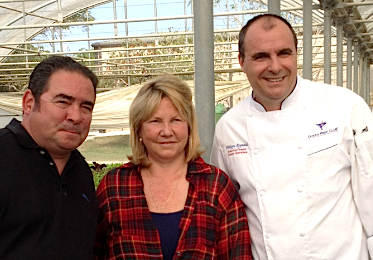 Many of South Florida’s finest culinary establishments serve Teena’s Pride locally and sustainably grown heirloom produce and Teena’s Pride fresh herbs during the November to April South Florida growing season. This season’s newest farm products: our wheat grass, sunflower sprouts, and micro greens are grown completely pesticide free! 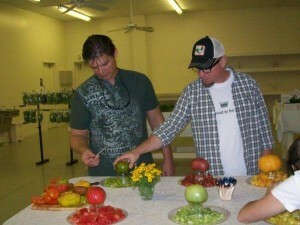 During our farming season we welcome all chefs to tour our farm and taste test our fresh produce. Call Teena or Michael at 305-216-2336 for a personally guided tour. What will Teena’s Pride produce mean to your customers? Please use our Chef’s Sign Up form to contact us! 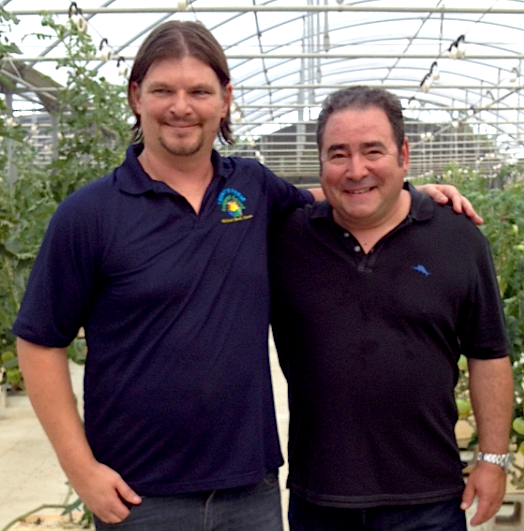 Emeril Lagasse, celebrity chef, restauranteur, television personality, and cookbook author, visits our family farm and walks through an heirloom tomato hydroponic greenhouse with grower, Michael Borek. 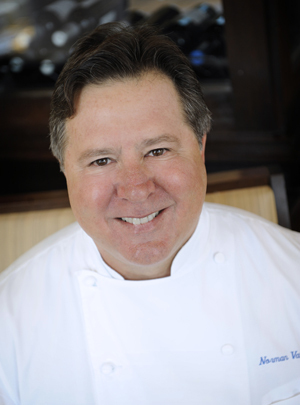 owner of Michael’s Genuine Food and Drink, a nationally renowned chef, and a recipient of the coveted James Beard Award of Best Chef of the South. 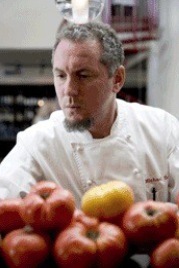 “Michael Borek is my kind of grower. He’ll plant pretty much anything for you and is always experimenting with new things, like keeping his own bees. You want baby spring mix, and he’s out there the next day cutting it young for you. It’s pretty much a restaurant’s dream. “This past season I received so many compliments from our restaurant patrons about the amazing tomatoes, herbs and lettuces Teena’s Pride Produce grows for Ocean Reef Club. The growers, Teena and Michael Borek, are real people. The superb quality of produce they grow is a direct result of the love they have for their craft. 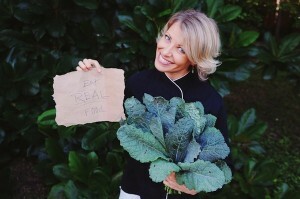 “Teena and Michael’s produce is simply amazing. I was excited to discover their product a couple years back when I toured the farm, shortly after moving to Miami. As soon as I spoke to Teena and tried the tomatoes and herbs I knew they needed a strong showing on EDGE’s menu. It’s a true pleasure to work with them and be able to showcase their product on our menus. When our guests taste the herbs, tomatoes or veggies that come from the farm they are simply blown away with how tasty the product is. 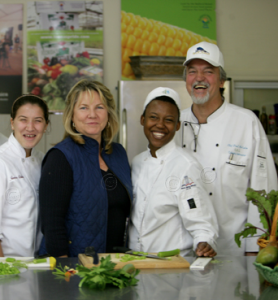 “I always joke around with our guests that Teena’s Pride produce makes my job as a chef too easy! It all starts with the ingredients, and the care that goes into creating great tasting, high quality produce. When I have these amazing ingredients to work with, I don’t need to do too much to them- I mainly strive just to provide them to guests in a way that showcases their true nature and flavors. As a chef, using this amazing produce, my job becomes more about highlighting the natural product and working the flavors to marry and compliment one another, rather than having to change or tweak them or mask them too much. 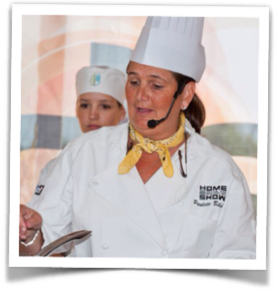 I have had the opportunity on many occasions to feature the amazing vegetables/tomatoes from Teena’s Pride and the Michael Borek Farm during cooking demonstrations throughout Dade County. There is an overwhelming consensus from my audiences that the freshness and flavor of these vegetables make you want to buy local/sustainable produce each and everyday! Monthly farm tours, farmers markets, restaurant delivery and local groceries making this produce available are only a few ways this produce reaches our tables, I encourage everyone to support our local farmers! Without these farms we will loose our ability to choose what foods we eat. Thanks Teena, Michael and all those who work and support the farm! 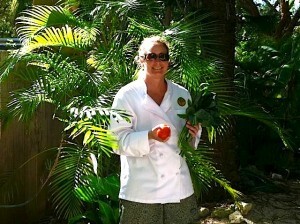 “Teena’s Pride has by far the most amazing vegetables, heirloom tomatoes and herbs in Homestead! 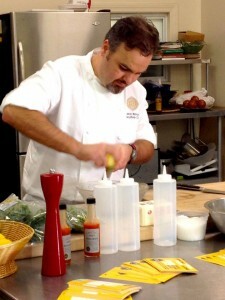 I love that they offer CSA to the local Keys Community and fresh product to us Chefs! I love creating beautiful salads with their fresh greens, radishes, tomatoes and herbs!